This race was one of Phil’s target events of the year. 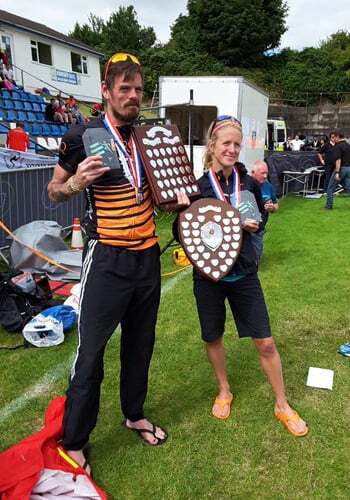 As the event was simultaneously hosting the British Masters Marathon Championships, which Phil won last year (when the event was held in Newcastle), Phil had designs on defending his title. “I had a great training block in the run up to the event and it would appear I’m finally back to full fitness since my calf tear at the start of the year. In the weeks leading up to the race, everything fell in to place and the last few weeks of training went perfectly. I was actually able to take 14 seconds off my 5k PB and on the Wednesday, in the lead up to the marathon, I did my 1st ever mile race on the track – which I won in 4:46:01. This meant I was confident of running a PB, despite the Isle of Man being known as a tough course. I planned to take the race out reasonably hard and see how I felt. After a mile, I had already opened up a lead and led from start to finish. 10 miles in, I heard that my lead was around a minute and I knew then that the race was mine to win! I was also well on target for a PB and felt incredibly comfortable. I continued to run at a fairly consistent pace throughout the whole race and had more in the tank in case any attacks came from the other competitors. I crossed the line in a new PB time of 2:36:42, to defend my British Master’s title, and take 1st place overall with a 10 minute gap between myself and second – plus, I also took the quickest time on the course in the last 10 years!